Serenity Reserve is a to-be-built residential community in Orlando, Florida. It will consist of 90 single-family homes and an elegant clubhouse with a full complement of amenities. The developer of the Serenity Reserve community, Jagdish Kulkarni, M.D., wanted to create a website that would attract home buyers age 55+, which is the target market for his community. His concept was to not only offer beautiful, custom-designed homes, but also many features and services that would appeal to seniors. Susan Greene worked with Dr. Kulkarni to write website copy that helped position the community in the senior arena and highlighted the offerings that made it especially attractive to older, retired couples. In addition, Susan researched the location of Serenity Reserve and described how close and convenient it was to grocery stores, pharmacies, golf, shopping centers and Lake Nona Medical Center, the 650-acre development that’s home to some of the nation’s top hospitals and physician practices. 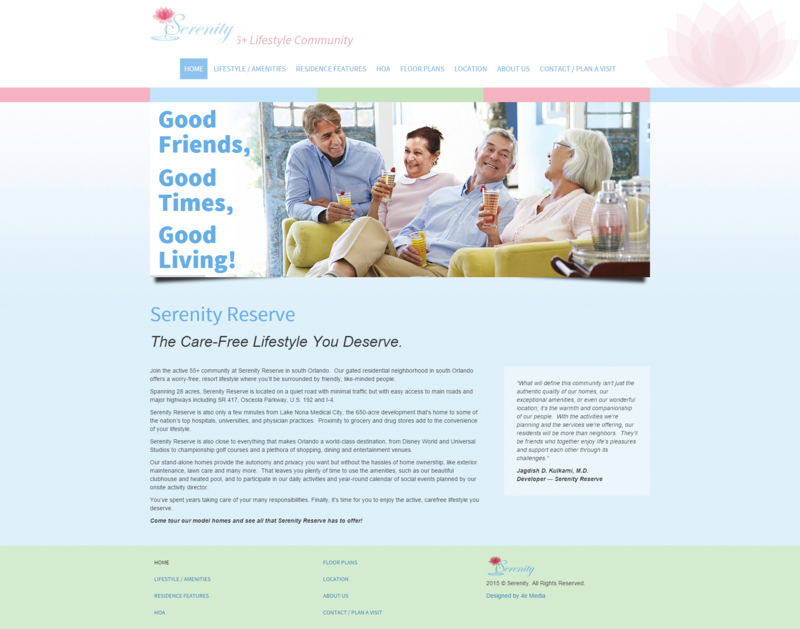 The Serenity Reserve website was step 1 in a series of marketing initiatives to be implemented in introducing the community. It set the tone and branding for various advertising and marketing campaigns that will be launched in 2016. Thank you for your work and the expertise. More importantly, I valued your patient attitude and your level of attention when I was sharing the concept and the vision of my real estate development with you. Your simple and effective way of writing hopefully will make our property visceral for prospective home buyers. Does your website effectively communicate the best features of your organization? If not, we should talk.